Born out of tragedy and necessity, Tipsy and the Donuts is a musical romp through seven decades of tuneful favorites. When Pete Jarvis (of the Pete and Wayne Show), Larry Strickland, and Ben Taddiken, suddenly found themselves on stage after a tragedy befell the Sloppy Joe’s family in September of 2018, they had no chance for rehearsals or a planned set list. 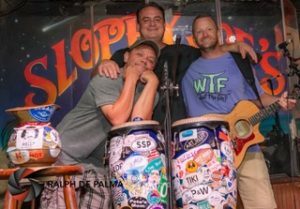 The three literally met for the first time at the foot of Sloppy’s stage and the magical mix was instantaneous from that moment on. Since then “Tipsy and the Donuts” has blossomed into a festive, entertaining, powerfully joyous, musical experience. Watching Tipsy and the Donuts, one will be amazed by these facts: They play with no fancy electronic enhancements…no guitar loopers, no foot pedals, no harmonizers, no reverb to fatten the harmonies, no I-pads, no prerecorded backing tracks, and no drum machines. The three play with nothing more than wood, steel, pig skinned conga’s, an electric Bass, a tambourine, a shaker, and a whole lot of personality and humor. Songs from the 1950’s to present day hits, coupled with audience participation and interaction, and you’ll soon see why one reviewer wrote “ A Tipsy and the Donuts Show is like going to church, except everybody is , well, Tipsy!” Come sing and dance along, and you’ll soon find that grin on your face is infectiously genuine!